Prepare to be dazzled! This weekend, Londonist presents six lively interactive talks about the river starring some of our most interesting friends. 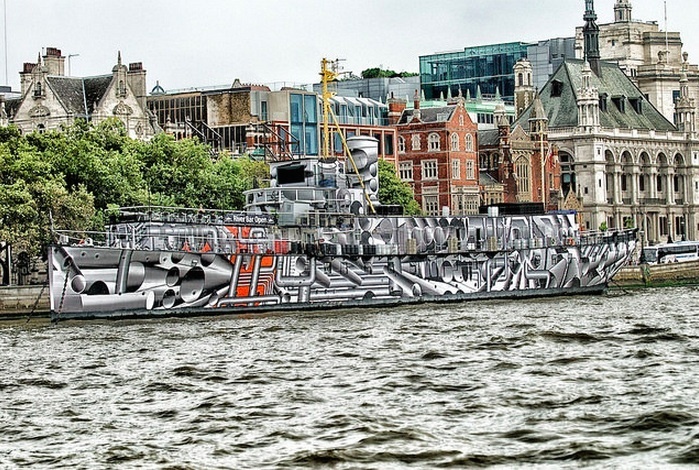 Take a break from your Open House schedule and join us aboard the Dazzle Ship HMS President for lost rivers, oddities, immersion, mysteries, dock tales, songs and stories. All events encourage participation with questions hosted by Londonist editors and team members. The boat bar will be open — so we can chill out and chat up on deck while watching the sun set over the river. Can't decide which talk to come to? Buy a day ticket and get three for the price of two. Tickets for each session are £7.50 or £5 concessions - except the family friendly session with London Dreamtime where under 11s go free! Come for the whole of Saturday or Sunday on a £15 day pass. Please book through the Totally Thames website. A few tickets will be available on the door.